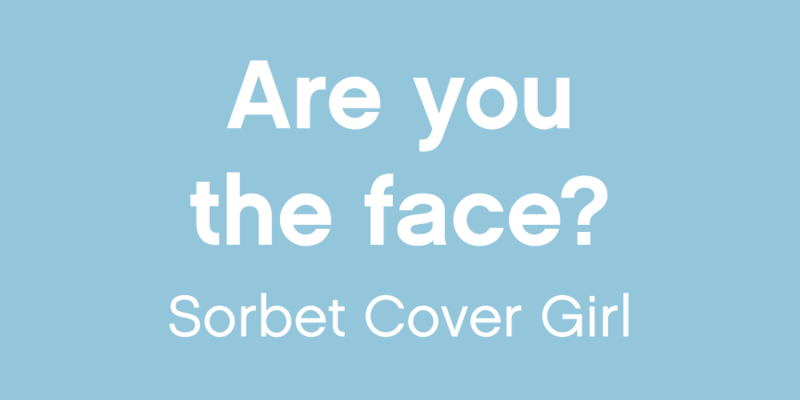 We’re shining the hot spot on South Africa’s freshest faces, in search of our Sorbet Cover Model. She’s got to be cool, she’s got to be sussed & she’s got to be a real South African beauty – inside and out. She’s fresh, she’s bubbly, she’s get-up-and-go. She’s a mover, shaker, bottle-washer & big city dreamer. She mixes her friends, and her eyeshadows; her BB Cream & her face mask. She hits 10 000 steps on a Tuesday & downward dog on an off day. She loves sand between her toes and Gelish on her nails. And she loves touching lives with her smile. She’s proud of her fro, her bronzer, her flick – and her manicure. She’s skin savvy and selfie snappy. She’s the Sorbet Cover Girl, with soul. And we want her! We want your face, we want your look and we want your shine. 1. By entering the Competition, all participants agree to be bound by these terms and conditions. 2.16) must acknowledge that you have not received an e-mail response for the top 100 participants (‘Top 100’) by the 30 June 2018, that your entry is unsuccessful. 4.4) Directors, members, partners, employees, agents of or consultants to Sorbet or any other person who directly or indirectly controls or is controlled by Sorbet and their spouses, life partners, immediate family members and business. 5.8) 1 (one) overall winner will be selected from the Cover Winners. 6. The overall winner will be selected by a group of judges who are representatives from Clicks, D&A and Clicks media partner, Beyond the Blue (Pty) Ltd. The winner will be drawn by 02 July 2018. The winner will be announced by 12 September 2018, the judges’ decision is final and no correspondence in this regard will be entered into. 7.3) the overall winner will receive a 3 (three) year modelling contract with D&A and a photographic portfolio shoot with a top photographer. All details relating to the portfolio and contract will be discussed with the winner directly and detailed in a written contract. 7.4) The Cover Winners’ name, image, voice and photographs will feature on various Clicks marketing platforms which may include television, radio, web, posters, and leaflets and on and/or within a Clicks ClubCard magazine. 7.5) The Cover Winners will participate in a country tour of selected Clicks stores. Clicks will cover the cost for travel and accommodation. 8. The Cover Winners will not receive a salary or income for the Clicks Cover Model photo-shoot. 9. Clicks and D&A will not be responsible for any loss of income should the Cover Winners not be able to obtain leave from their current employer. 11. By entering the Competition you grant explicit consent to this and agree to an agreed schedule of appearances. 12. Should the winners choose to bring a companion; partner or any person along, Clicks nor D&A will be responsible for any losses, damages or costs sustained or claims arising by such persons resulting from any travel or photo-shoot events. 13. Should the Cover Winners winners choose to bring a person under the age of 18 years of age, it is such winners’ responsibility to ensure the minor is taken care of in every aspect and not left unattended. 14. The prizes are not transferable and cannot be exchanged for cash or for any other item. If, for any reason, Clicks, D&A or Sorbet cannot provide any of the prizes, Clicks, D&A or Sorbet will award an alternative prize of a similar value. 15. The Top23 will be required to provide Clicks, D&A and Sorbet with proof of identification in the form of a valid identity document, passport or South African driver’s licence. 16.1) The relevant winners contact details will be obtained from the online entry form via the Clicks website. 16.2) Clicks reserves the right to disqualify a winners if they do not respond to the telephone call within 2 working days of being contacted, indicating that they accepts the prize. In such event, Clicks will be entitled to select another winner within 1 working day thereafter. 16.3) The Top 20 (excluding the Cover Winners) winners Sorbet makeup hamper prizes will be sent via courier by 31 July 2018. 17. The winners’ name will be published on the official Clicks’ website (clicks.co.za), may or may not be published in a Clicks ClubCard Magazine issue of 2018, Clicks official Facebook Page (www.facebook.com/ClicksSouthAfrica) Clicks official Twitter page (https://twitter.com/Clicks_SA), a Clicks leaflet, TV and radio. 18. Unless the winners specifically states otherwise, each winner agrees to participate in all promotional activity and hereby consents to Clicks, D&A Model Management and Sorbet using her name, images and/or voice in any promotional material for the purpose of promoting the competition. No compensation will be payable for such use. The winners will have the right to withdraw her consent for the use of her name, images and/or voice prior to the contracts being agreed upon and signed by the winners, Clicks, D&A Model Agency and/ or Sorbet. 19. A copy of these terms and conditions will be available on the official Clicks’ website (clicks.co.za) from 08 March 2018 until June 2018. 20. By participating in the Competition, you agree that neither Clicks, D&A nor Sorbet nor any of their respective advertising agencies will be liable for any losses, damages, costs or claims in connection with the Competition or resulting from acceptance, possession, or use of any prize. 21. CLICKS RESERVES THE RIGHT TO TERMINATE, SUSPEND OR AMEND THE COMPETITION, as well as competition rules FOR REASONS BEYOND ITS CONTROL. CLICKS AND ITS SERVICES PROVIDERS, INCLUDING ANY TELEPHONE NETWORK PROVIDERS, ARE NOT RESPONSIBLE FOR INCORRECT OR INACCURATE TRANSCRITION OF ENTRY INFORMATION, TECHNICAL MALFUNCTION, LOST OR DELAYED DATA TRANSMISSION, OMISSION, INTERRUPTION, DELETION, LINE FAILURE OR MALFUNCTION OF ANY TELEPHONE NETWORK, COMPUTER EQUIPMENT OR SOFTWARE, THE INABILITY TO ACCESS ANY WEBSITE OR ONLINE SERVICES OR FOR ANY OTHER ERROR.